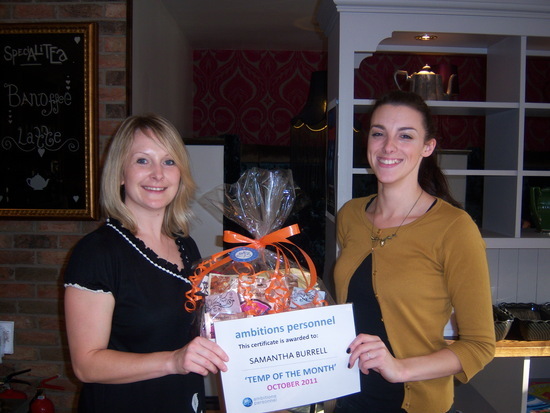 October’s Temp of the Month is awarded to Samantha Burrell of Lincoln. Samantha has been an exemplary member of our temporary team and we have received glowing reports from our client. Pictured is Susan McCormick presenting Samantha with a Thorntons Hamper and her Temp of the Month Certificate. The annual event which is taking place at the Epic Centre, Lincolnshire Showground on Thursday 11th November will be hosted by BBC sports personality John Inverdale. We would like to take this opportunity to wish all finalists the very best of luck! This year there are 17 different categories, including the above. Tickets are available now, please visit www.lincolnshiresports.com for further details. The winners will be announced on 4th November 2010 at the annual awards ceremony held in central London. 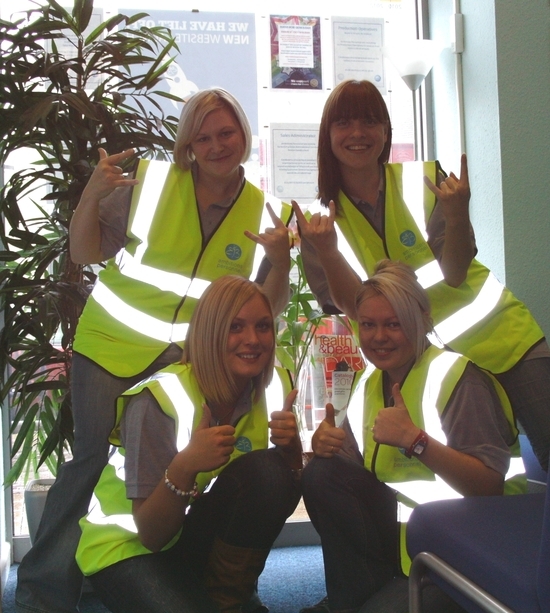 Pictured are the Ambitions Personnel team preparing for the annual Sleepwalk in aid of Beaumond House, Newark. Pictured are staff from our Boston office raising money for Jeans for Genes Day on Friday 1st October 2010. Congratulations to September’s Temp of the Month – Lez Hakcett of Mansfield. Lez has been assigned to various temporary contracts throughout this year and we have received fantastic feedback from all of our clients! 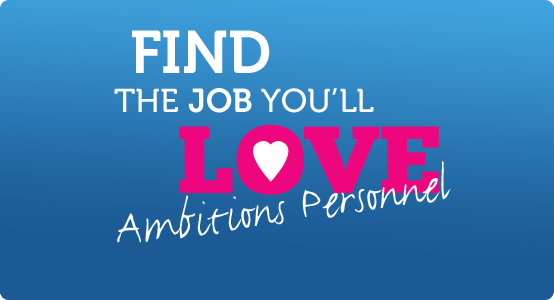 Lez has proved to be a reliable and flexible member of our temporary team – often working at short notice! To thank Lez for his loyalty and hard work, we presented him with his choice of vouchers! Pictured is Lez with Claire Nash of the Mansfield branch. 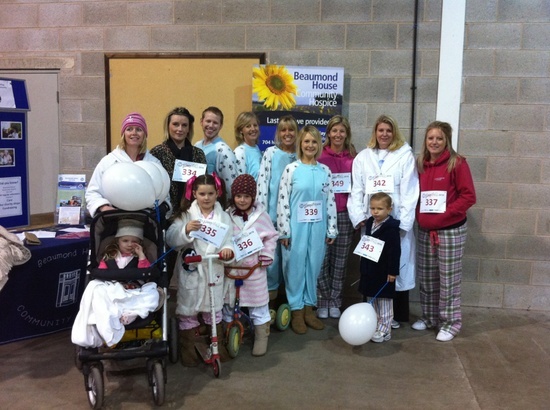 The Forget Me Not Sleepwalk will be taking place on Saturday 9th October at Newark Showground. The annual event organised by Beaumond House follows on from the ‘Pyjama Day’ on Friday 8th October and is aiming to raise as much as possible for the local charity. The event will see entrants completing a one-mile walk around the showground in the dark, wearing their pyjamas! There is also lots of family friendly entertainment planned for the evening, starting from 6pm. Beaumond House is a registered charity based in Newark that provides supportive palliative care to patients with life limiting or terminal illnesses and their families living in Newark and district, since 1987. As part of their annual ‘Forget Me Not’ weekend they are now extending the fundraising to an annual ‘Pyjama Day’ to be held on Friday 8th October 2010. Members of the local community are encouraged to go to work or school wearing their pyjamas or fancy dress! The Newark branch of Ambitions Personnel will all be joining in by working in their pyjamas for the day – aiming to raise valuable funds for this worthwhile local charity! If you wish to support their fundraising efforts, you will be able to donate by visiting the Ambitions Personnel at 4 Cartergate, Newark on Friday 8th 2010. • For workers aged 16 and 17: the rate will increase to £3.64 from £3.57. There will also be the introduction of a National Minimum Wage for apprentices of £2.50. This will be applicable to apprentices under the age of 19, or apprentices aged 19 and over who are in the first year of their apprenticeship. Jeans for Genes Day 2010 is taking place on Friday 1st October 2010. 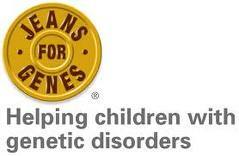 Ambitions Personnel will be supporting this worthwhile cause by donating money to wear our jeans to work for the day! You can donate by visting any of our offices or visit www.jeansforgenes.com for details of how you can take part!